The sandstorm that preceded the match, and the howling wind that persisted during it were in stark contrast to the actual game of cricket, which saw less roar and more whimper from the home team. 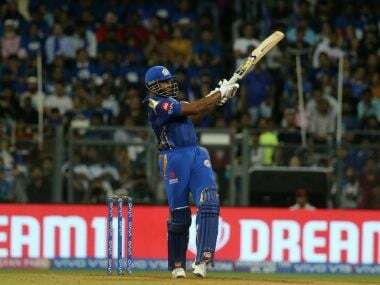 Rajasthan Royals (RR) slid to their fourth defeat in five games, after they were given a lesson in how to use their home conditions by the opposition. RR had enjoyed a five-day break after playing their last three matches in six days. They had been parked at the Sawai Mansingh stadium in Jaipur since the start of the month. They had had all that time to closely watch the pitch, train on others like it, and pick their squad accordingly. 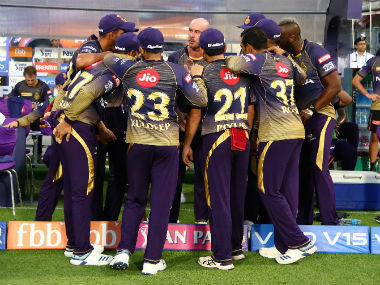 In the end, it were the Kolkata Knight Riders (KKR) who made better decisions, both before and during the game, to the point where, if you disregarded the pink shirts in the stands, it felt like a home game for KKR. RR could not have asked for a better surface to give Ish Sodhi his first game in the IPL. The leg spinner made quite an impact last year, when he finished the six games he played with an economy of just 5.86. But it would have meant substituting one of their star overseas all-rounders, Jofra Archer or Ben Stokes. Most thought both too valuable to leave out, certainly the million-dollar Stokes. But among the two, Archer has been more incisive with the ball and effective with the bat; Stokes has leaked 10.84 runs per over this season and only put in one substantial score with the bat. Leaving Stokes out would have been a big call, and would have weakened the batting, especially with Sanju Samson still injured. But the impact that a quality leg spinner offered on that pitch was a big carrot, one that RR didn’t take. They opted to give a debut to leg spinner Sudhesan Midhun instead, while sound in theory, meant they had a struggling Stokes on the field and a potential game changer on the bench. 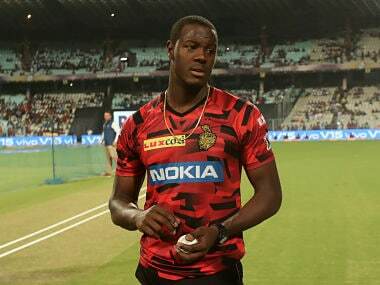 In contrast, KKR played three and a half spinners, two of them overseas players — Piyush Chawla, Kuldeep Yadav, and Sunil Narine backed up by the off-cutters of Harry Gurney, who claimed Player of the Match for his figures of 2 for 25. “We knew we were going to go really hard in the Powerplay, because in the end it really slowed up,” said Chris Lynn after the game. RR might have had the same intentions, but their Powerplay enforcer Jos Buttler struggled to get away the spin bowlers, scoring just 19 runs off the 22 balls of spin he faced in his innings of 37 from 34. 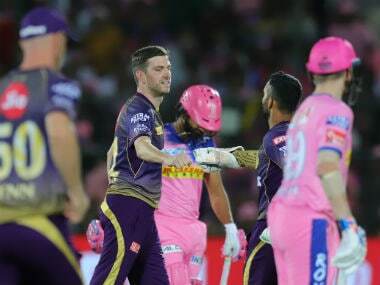 And that was because KKR matched him up smartly, bowling only two overs of pace in the first nine overs of the game, after which Gurney provided more revolutions. In contrast, RR used only one over of spin in their first six overs, and even that was carted around for 22 runs by Narine. The plan to use pace was most likely to counter Narine, and it even created an opportunity when the West Indian was dropped in the fourth over. But it was another case of strategic superiority from KKR, as Narine faced only four balls of pace in the first thirty. The KKR openers ended up scoring 65 runs in the first six, the highest Powerplay score this season. 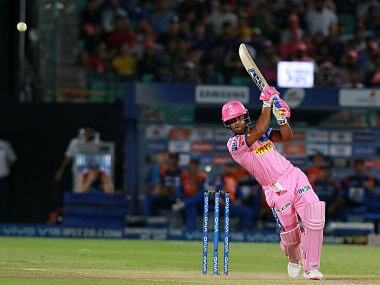 That meant that when the RR spinners, Shreyas Gopal and Midhun came in, there was no scoreboard pressure left to use. “We had a nice Powerplay, and it was cruise control after that,” added Lynn. 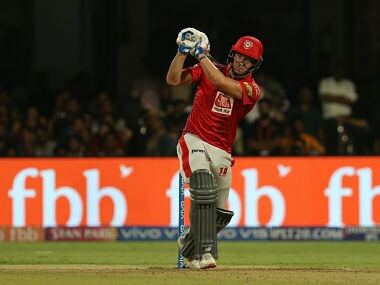 Steve Smith finished with his highest IPL score of 73 from 59 balls, and the way he was batting, it almost seemed like the pitch was extremely difficult. It seemed like he had played just the role that was required, and RR finished on 139 for 3 in their allotted overs. But after KKR batted, the RR think-tank would have been wondering had they been better off being more aggressive, and perhaps ending with 150 for 7. Don’t judge a pitch until both sides have batted on it, they say. After KKR had their fun, the judgement lay heavy on RR. RR were weakened without Samson, Buttler was blunted against spin, so they were forced to play much more conservatively. But that meant Archer, and specialist batsman Prashant Chopra, did not even bat. Stokes came in with only 26 balls left in the game, and then laboured to a painful score of 7; painful not just because it came off 14 balls, but also because he was hit by a beamer while batting. The only reason RR are not at the bottom of the table is the abysmal season that Royal Challengers Bangalore (RCB) are having. Most of their overseas talent is not available for the back end of the tournament, so the chances of them qualifying are slimming as fast as a crash diet gone wrong. To make things worse, they play table toppers CSK next, mercifully at home. But the walls of their fortress are crumbling, if they don’t turn things around, their campaign could be over by the halfway mark.